Three Diocesan Catholic School teachers were nominated and selected as Educators of the Week sponsored by WREG, News Channel 3. 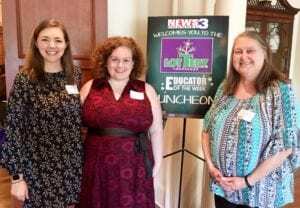 They were nominated by a student, students or families during the year and WREG-_TV recognized them again at their annual Educators of the Year luncheon. Ironically, all three have connection to St. Benedict at Auburndale High School in addition to their respective schools. (from left) Kathleen Bray, a teacher at Resurrection School and a 2013 graduate of St. Benedict; Kaitlin McCumber, English teacher at St. Benedict and Laina Haff, who is on the faculty of Holy Rosary School. Alaina’s three children graduated from St. Benedict.